Come to the Driftless Area of Southwest Wisconsin to experience some of the finest Spring Creek Fly Fishing in the United States. Located in Madison, Wisconsin, Spring Creek Specialties can provide a top fly fishing experience with long time professional guide, Jim Bartelt. This area in Southwestern Wisconsin was left untouched by the most recent glacial advances. The result is a very hilly topography with steep green valleys. Coursing through most of these valleys are thousands of miles of spring creeks that support excellent aquatic insect life, crustaceans, forage fish, and of course, trout. These are true limestone spring creeks similar to those found in England and Pennsylvania. 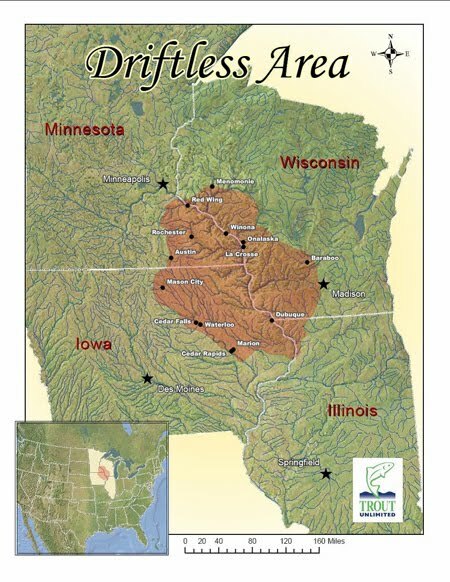 The Driftless Area encompasses the largest area of spring creeks in the United States. They vary in size, but most are quite small and intimate, requiring special approaches and techniques. Many miles of stream are open to public fishing. The Driftless Area of Wisconsin has some of the best public access for Trout fishing in the United States. Some streams are managed for trophy Rainbow and Brown Trout. Others support Wisconsin native Brook Trout. Each stream is managed individually, with the goal of maximizing it's potential. The Wisconsin Department of Natural Resources, along with local sport clubs and Trout Unlimited, have improved many miles of stream and created habitat for wild Brown and Brook Trout. "Jim's great experience and knowledge of the Spring Creeks of Wisconsin are excellent. I have spent many fine hours fishing with him. He is an outstanding teacher. I learn something new every time I go out with him." " I have fished the spring creeks with Jim on several occasions. It is always a great experience. He challenges me to improve my skills and I have become a better fly angler. His lunches are fantastic." " I always enjoy a day in the Driftless with Jim! His years of classroom teaching allow him to effectively analyze angling skills and communicate techniques of improvement. He definitely helps his clients become better fly fishers." -Wm Engber M.D., Madison, WI. Jim has a lifetime of fly fishing experience and has been guiding anglers for trout on these spring creeks since 1990. 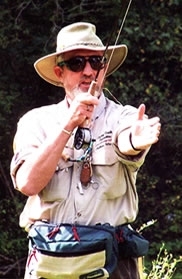 He is a professional fly casting instructor and veteran Fly Fishing School Instructor. Jim, now a retired teacher, had taught for 35 years at Madison East High School. He has spent his entire career sharing knowledge with others. Let him share his knowledge of fly fishing and the intricacies of his home waters with you. If you are new to the sport, he can definitely shorten your learning curve. If you are an experienced angler, he can share proven tactics that are unique to the area streams. He will also share fly designs that he has developed that are unique and have proven to be effective.